The Fords of Avon Refuge (Avon is pronounced a’an) is situated on the north bank of the River Avon at NJ 042 032, where the Lairig an Laoigh crosses the river by way of stepping stones. The structure is a refuge rather than a conventional bothy, providing only the most basic shelter. It comprises one small room (it will sleep three to four people in reasonable comfort, but any more will be playing at sardines) with a door but no window. The inner core of the building is wooden but, following renovation by the MBA in 2011, is fully insulated and weathertight. This compartment is surrounded by a thick casing of granite boulders which, if they tend to make it rather inconspicuous in a landscape filled with granite boulders, do at least ensure it’s not going anywhere no matter how strong the wind. In a word: none. There is no fire, no sleeping platform, no seats, and no television lounge either. None. You even have to bring your own spade. But do make sure you go a good distance from the refuge. The River Avon, just yards from the door, is legendary for its clarity and is good to drink. Just don’t fall in. The Fords of Avon Refuge was built by Fleet Air Arm ratings under training in June 1970 as an emergency refuge. It is on record as having saved a number of lives, being the only shelter for many miles in an area where people seem to excel at getting lost. By the turn of the century it was becoming increasingly dilapidated and in 2011 the MBA, with the MCofS and assistance from the RAF, replaced the original structure with a new, insulated, wooden core shelter, and rebuilt the characteristic granite ‘shell’ around it. The refuge is now maintained by the MBA. visited the refuge about a week ago and thought to myself if the river avon was in very high the refuge would be hard to get to if needed in emergency, footbridge would be a plus I know finances would be a stumbling block! Sometimes the river is unfordable – as are several others. FoA Refuge has been a lifesaver in the past, but there are limits to how much development people want to see. Bridges over every burn? 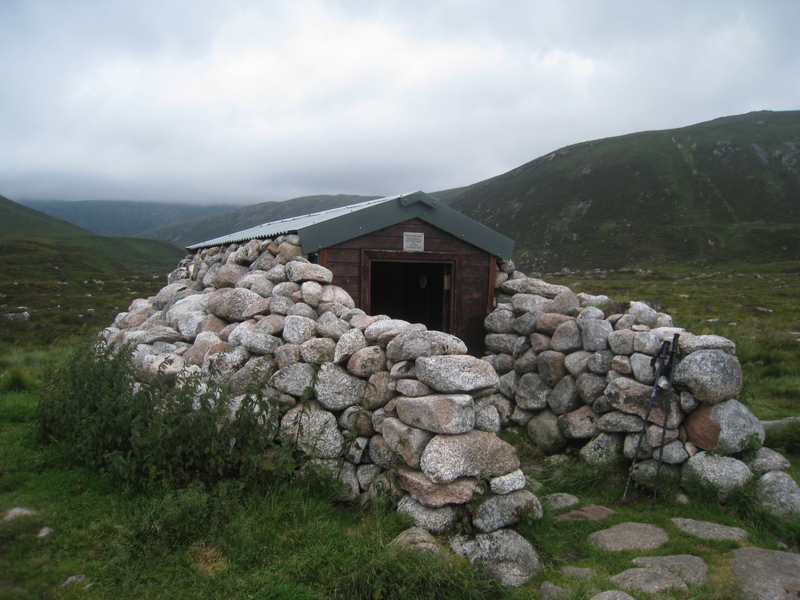 Bothies in every glen? Road access for emergency vehicles? Where would you stop. I think a bridge would be overdevelopment here – and did indeed argue against it way back in the ’80s. Changed days now. You’d almost be tempted to stay at Fords of Avon – but, on the other hand, Bynack Stables is now long gone. Ryvoan still there though and looking good when I dropped in there on New Year’s Day.